Slit Envelope Gaskets - are essentially ring gaskets with 0. 020" thick leaves slit from the OD to approximately 3/64" from the id. These slit envelope gaskets are the most widely used gasket type in sizes for 1" to 12" OD. Material: PTFE, EPDM, Neoprene, Viton, Nitrile. Teflon gaskets are widely used in chemical plant, glass lined equipments etc., due to their high temperature, corrosion and ageing resistant qualities. Our company has set benchmark in offering Teflon Gaskets or Industrial Gaskets to the clients. Teflon Gaskets are designed and made by using high grade material and latest technology. 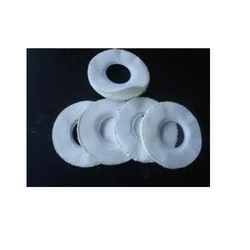 We are successfully engaged in the supplying of quality rage of PTFE Gaskets that are designed using moulding method with PTFE granular resin. These are in line with the varied international quality standards with excellent chemical and temperature resistance. 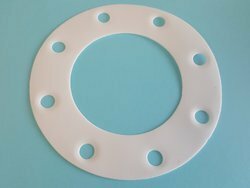 PTFE Gasket is available in various shapes and sizes and used as good sealing material. We have maintained cordial relations with our respected customers by providing them with a comprehensive assortment of Teflon Gaskets within the fixed time frame. PTFE has excellent resistance to most mineral and organic chemicals such as acids, bases, and solvents, and can be used up to approximately 260 C.
PTFE is generally used in the presence of aggressive chemicals. It can be supplied as a bore liner to shield pipe gaskets from chemical attack: these are supplied to fit specific bore sizes, and are known as PTFE envelopes.